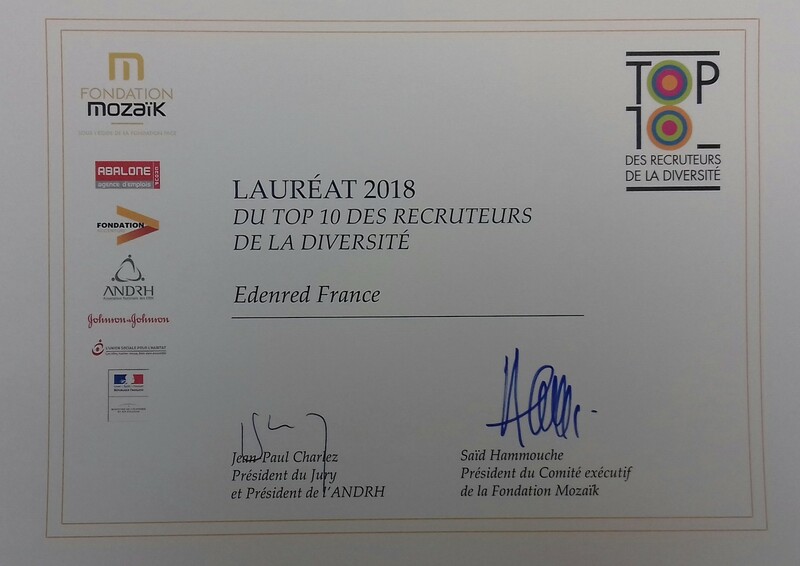 On November 27, the Mozaïk Foundation awarded a 2018 Top 10 Diversity Recruiters trophy to Edenred France in the “Talent Integration” category, in recognition of the company’s efforts in favor of equal opportunities. The goal of this event, organized under the aegis of the French Ministry of Economy and Finance, is to: “Inspire every company in the country, by rewarding those companies that have already understood, before the others, the benefits of opening up their recruitment processes to new profiles.” Three criteria are assessed: the sourcing of job applicants, the assessment of the applications received (preselection of resumes, selection of the applicants, interviews, tests, etc. ), and the integration of the new recruits. an induction period on the company’s premises. This year, 14 job seekers took part in this process, and they all received training and a certification. At the end of the assessment stage, nine applicants were offered a 12-month fixed-term contract, convertible into a permanent contract, which eight of them accepted. The candidates were particularly pleased with the induction and integration process throughout the course of training. This new approach to recruitment adopted by Edenred France focuses on the applicants’ behavior and motivation. The company’s managers are more closely involved in the process and recruit those applicants who are particularly motivated by the job on offer. The job seekers receive training and a certification provided by the French State employment agency, even if they are not hired by the company. Edenred France plans to extend this initiative to other company functions in the longer term. Congratulations to everyone involved in this successful initiative!